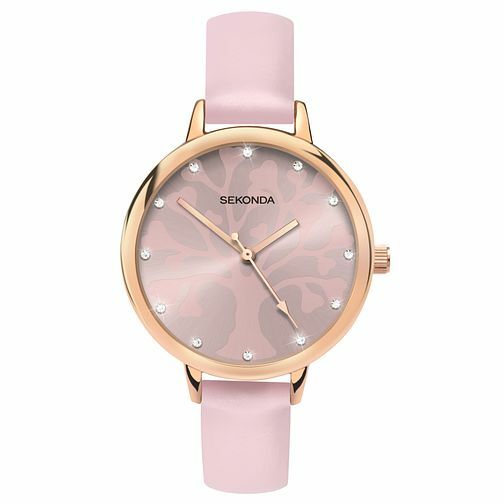 This elegant Sekonda Editions ladies' watch features a rose gold plated case and a pink sunray dial with a charming tree of life design to beautifully represent growth, family, friends and maternity. The glistening clear crystals set as hour markers add a touch of glamour to this gorgeous timepiece. The polyurethane pink strap adds comfort and effortless style to make this sweet and sophisticated ladies' watch perfect for any occasion. Editions is the fashion-forward arm of Sekonda featuring on-trend styles that are fun and affordable. Sekonda Editions Ladies' Tree Of Life Design Pink Watch is rated 4.3 out of 5 by 3. Rated 5 out of 5 by Anonymous from Great service and product Really happy with the product I received and the service was excellent. Ordered on a Wednesday night and it arrived by Friday. Very happy indeed.